Attorneys who volunteer at the Honolulu District Court Access to Justice Room and Chief Justice Mark E. Recktenwald (center) during a recent gathering. The event was organized and sponsored by the Legal Aid Society of Hawaii and the Hawaii State Bar Association. 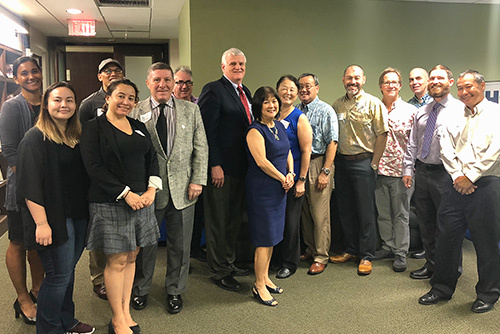 A Honolulu Access to Justice Room breakfast was held on November 8, 2018 in the Hawaii State Bar Association (HSBA) Conference Room. Chief Justice Mark E. Recktenwald thanked the individual attorneys who volunteered on Fridays to staff the Honolulu District Court Access to Justice Room for donating their time and talents. Twelve attorney volunteers, one University of Hawaii law school student volunteer, and two AmeriCorp members attended the breakfast, which was organized and sponsored by the Legal Aid Society of Hawaii and the HSBA. Chief Justice Recktenwald also thanked Legal Aid and HSBA for their tremendous support in making the Access to Justice Room available to individuals needing legal guidance. The attendees then took the opportunity to share thoughts and stories about their experiences volunteering, expressing how gratifying the experience has been. The Honolulu District Court Access to Justice Room first opened in August 2012 as a collaboration between the HSBA, Judiciary, Hawaii Access to Justice Commission, and Legal Aid. Since then, it has had over 5,000 visits from people seeking help with their civil legal problems. Thanks to these volunteer attorneys, as well as law firms and other organizations who commit their time and legal skills to ensure access to the legal system for those in our community, the program has been a success. The law firms and organizations will get together at a future date. To the vital group of attorneys that our community relies on to keep the Honolulu Access to Justice Room going, the Judiciary extends its sincere thanks and appreciation.